I am so excited to be a part of My Desert Cottage's "Where Blogger's Create"
I must admit my place where I create is in chaos. I moved from my original room to a much smaller room to accommodate my son, his wife and daughter. Why they moved in with us is another story. So, what do you do when you move into another smaller space. Well, some of my craft items that I do not use anymore are located in a storage area, so that I can access them when I want to use them again. As my new space is much smaller I had to come up with storage ideas to store most of my paper products and still have room to create and draw. I am a painter as well as scrapbooker, card maker and jewellery maker. I create paper products for markets and I am always trying to find stamps, paper s and adhesives. I am slowly trying to organise my space so I can find things easier and faster. I saw one blog last year that had all their paper items in colour groups. 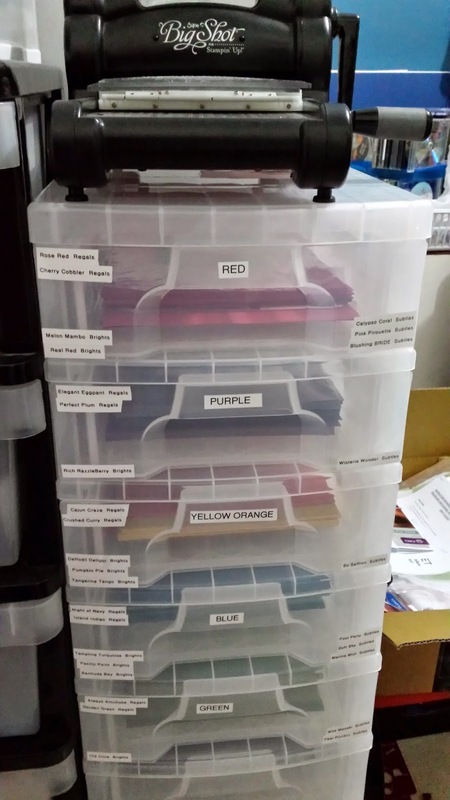 So, I put all my A4 cardstock in a drawer system with labels for the colour groupings. My 12x12 card stock I put into these great storage containers I found in the local Spotlight store. 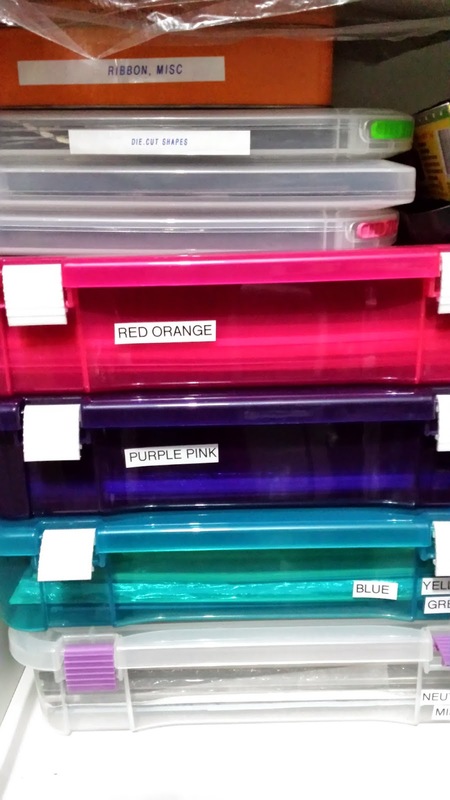 I love using my label maker and it came in handy to label my cardstock drawers and storage containers. I used my shoe rack I got from IKEA for my punches. 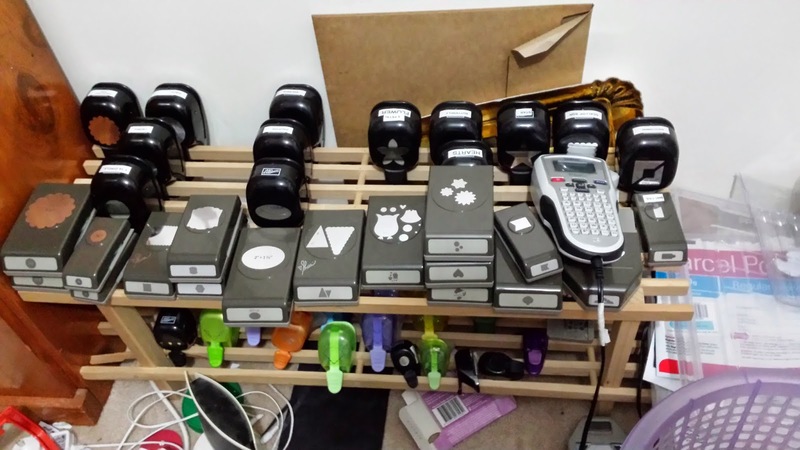 Oh and I used my label maker to label some of my punches so I know what they are at a glance. I have 2 workspaces. I paint a lot of canvases, so half of my garage is my painting studio. I have my paints, easel and workbench out in my garage. I share my space with the car of coarse, so I can't paint like Pro Hart. 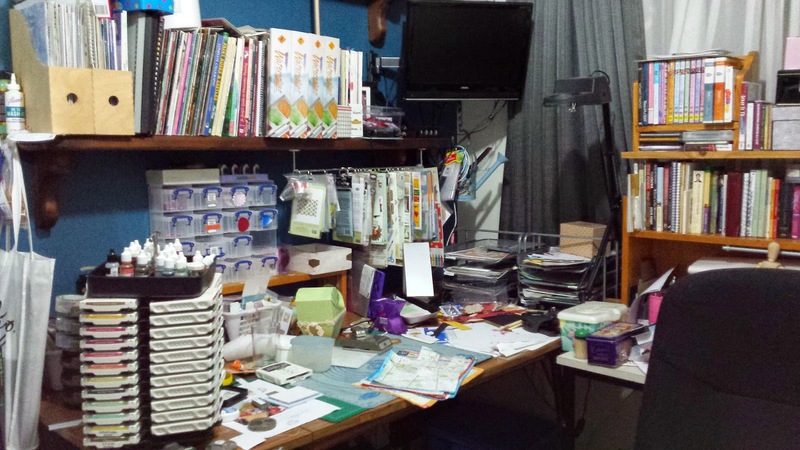 I still have so much more organising to do in my workspace! I am hoping to find some really great storage ideas on the Where Bloggers Create 2014 Link Party. Maybe next year I will have my workspace more organised. Hi Tracy, I had to downsize also. My husband and I moved to a smaller house. Like you I have things in a storage room. I'm sure you will find some great ideas on the tour. Thank you Helena. 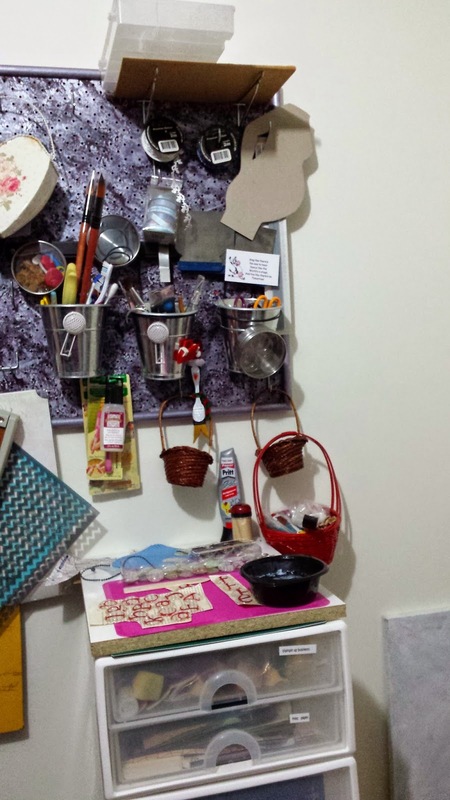 It is very inspiring to see all the spaces where people create from and how they organised them. I thought for just moving in and reorganizing that your space was wonderfully organized! 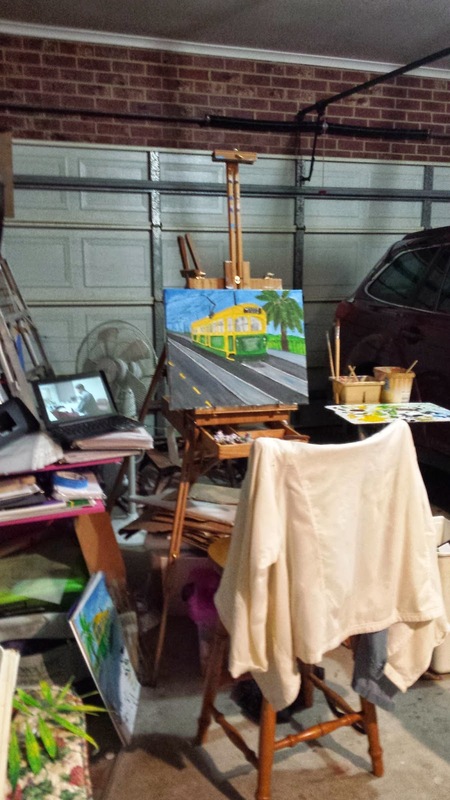 Love the idea that you paint in the garage. The video ad was hilarious! Enjoyed my visit today. I know what it is like to down size and loose your space. It's a work in progress. Thanks for sharing. My space is small, too, Tracy, but that is an upgrade from what I had! : ) You are a good Mom for giving up your creative space to your son and his family. I use clear storage for my scrapbook papers, too, which I also store by color way. I find it makes it easier for me to store more in a limited amount of space. I'm hoping to add some paper punches to my supplies. I do need to make sure I have some place to store them though, so I'm thinking of getting a canvas shoe organizer for the back of my door. I would embellish it up and make it pretty, but I think it would come in handy and help me utilize that dead space behind the door. The canvas shoe organiser is a great idea! If I did that it would give me more storage where my current punches are :) I was thinking as I read this I would punch out something cute with the same of the punch that goes in the pocket. That way I know which punch is in which pocket. I like how you made the best out of your new smaller space. Labels are a great thing. Thanks for the tour! Thank you Jennifer. Thank you for visiting. Thank you for joining the party Tracy and showing people that we can wonderful creative work places in small spaces!! My pleasure. I am finding a few others that have moved to smaller spaces. My dream is a large studio for all my art. Thank you. We certainly do find a way and a space to create.